The weekly show will offer viewers insight into the latest headlines coming out of the Holy See and highlight the history and traditions of Rome. Alicia Ambrosio will host the show, aimed at helping “make sense of the inner workings of the heart of the Catholic Church,” according to an announcement on the show. Ambrosio will bring “her expert insight and analysis into the Vatican happenings” along with her experience of living in the Eternal City. 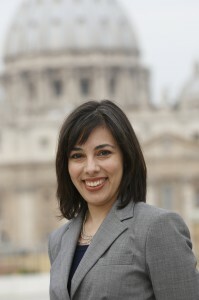 Originally from Vancouver, Ambrosio moved to Rome in 2004 and completed her graduate studies at the Salesian Pontifical University and trained with Catholic News Service at its Rome bureau. She moved back to Canada in 2007 and worked with Catholic press in various cities. In 2008, Ambrosio joined the Salt and Light team in Toronto. She was a Vatican correspondent for Salt and Light and worked in Madrid for World Youth Day 2011. Prior to her new assignment as host of “Vatican Connections,” Ambrosio as a producer has been managing the broadcast team for Salt and Light’s daily current affairs show, “Perspectives,” and writes and hosts “Catholic Focus,” among other duties. More information is available on the website saltandlighttv.org/vaticanconnections. Every episode also will be available on Salt and Light’s YouTube channel. Salt and Light Television began broadcasting 24-hour, noncommercial Catholic programming to Canadian cable TV subscribers in 2003.